These large, flightless, and wing-propelled diving seabirds were found in late Eocene to early Miocene deposits of the northern Pacific, i.e., western North America and Japan. Most fossils come from deep-water strata which were deposited offshore (Goedert and Cornish 2002; see, however, Sakurai et al. 2008). The earliest specimens assigned to the taxon belong to an as yet unnamed species from the late Eocene of Washington State (Goedert and Cornish 2002). They include a partial skeleton referred to as the "Whiskey Creek specimen" by Goedert and Cornish (2002), with which are associated three small pebbles that were interpreted as gastroliths by these authors. The earliest named species, Phocavis maritimus Goedert, 1988, is based on a tarsometatarsus from the late Eocene of Oregon (Goedert 1988). The tarsometatarsus of P. maritimus is less robust than that of later species and still exhibits a well-developed distal vascular foramen (Fig. 7.4). The presence of this plesiomorphic feature may suggest a sister group relationship between P. maritimus and the other plotopterid taxa whose tarsometatarsus is known. Goedert and Cornish (2002) noted the presence of at least five different taxa of plotopterids in the late Eocene and early Oligocene of Washington State, which demonstrates a high diversity of these birds in the Northeastern Pacific during the Paleogene. The only named species from these deposits is the early Oligocene Tonsala hildegardae, whose original description by Olson (1980) was complemented by Goedert and Cornish (2002). Skull remains of the Plotopteridae were described by Hasegawa et al. (1979) and Goedert and Cornish (2002). According to Olson (1980), there were deep temporal fossae but no supraorbital fossae for salt glands. The mandible of Tonsala hildegardae is long, straight, and slender (Goedert and Cornish 2002). feather quills; similar structures otherwise only occur in the Sphenisciformes. As in penguins, the tarsometatarsus is very short. 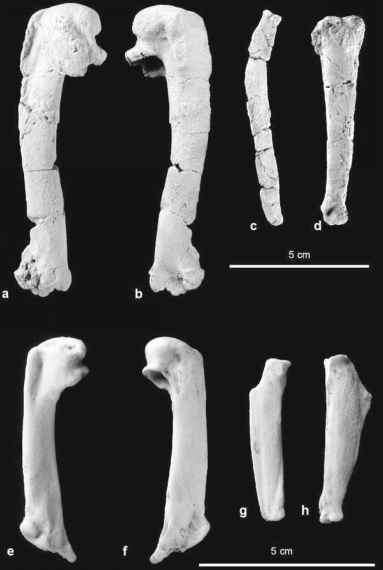 The similarities between plotopterids and penguins are especially evident if plotopterids are compared with stem group representatives of the Spheniscidae, such as the recently described Paleocene Waimanu (Sect. 7.3). 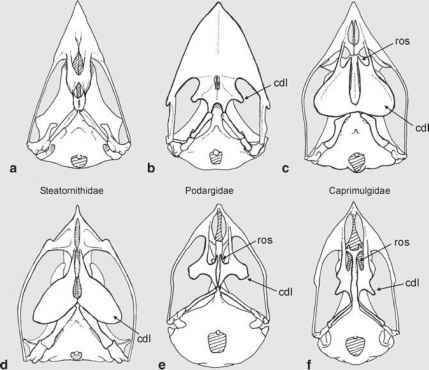 Plotopterids differ, however, from penguins and agree with the Suloidea in the presence of a distinct nasofrontal hinge, the absence of fossae for salt glands, the presence of a protruding furcular articulation facet for the acrocoracoid process of the coracoid, the very long acromion of the scapula, and the fact that the furcula articulates with the tip of the sternal carina. The similarities between Plotopteridae and Spheniscidae were attributed to convergence by Olson (1980) and Olson and Hasegawa (1979, 1996), who considered plotopterids to be most closely related to the Phalacrocoracidae and Anhingidae. By contrast, I proposed a sister group relationship between the Plotopteridae and the Sphenisciformes, and detailed that the derived similarities shared by plotopterids and taxa of the Suloidea do not necessarily contradict this hypothesis (Mayr 2005b). It was indicated in Chap. 3 that there exists morphological and molecular evidence in support of a sister group relationship between the Spheniscidae and the clade (Fregatidae + Suloidea) (Fig. 7.1). 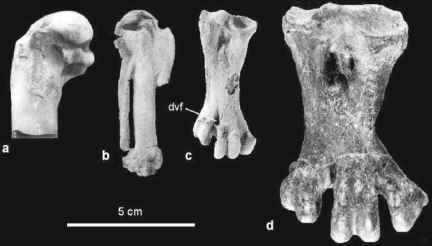 It is further known that several traits of the peculiar morphology of penguins, such as the incomplete fusion of the metatarsals, are of neotenic origin, and neoteny may account for the absence of derived characters in penguins, which are shared by plotopterids, Fregatidae, and Suloidea (Mayr 2005b). As noted in the following section, the earliest sphenisciforms are very similar to plotopterids, which further supports the hypothesis that the resemblances between these taxa are due to common ancestry rather than convergence.